Jessica Sporn Designs: Happy New Year and Gelli Plate Party Time! Happy New Year and Gelli Plate Party Time! Gelli Plate girl was invited to a party over at Carolyn Dube's blog! and headed over to join the fun. 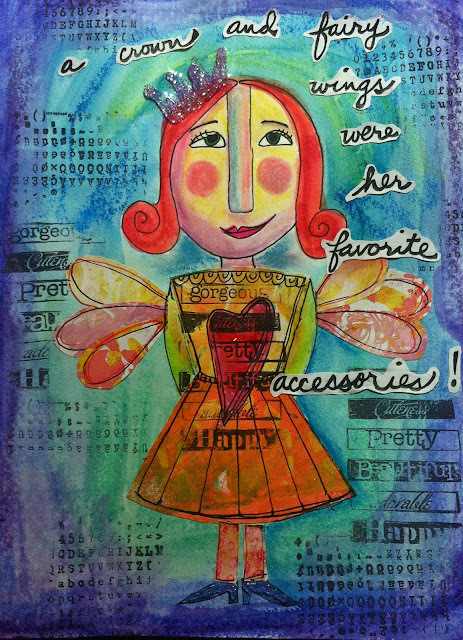 Her party dress, heart and wings were made out of the finest gelli plate collages! She thought she looked just mahvelous for New Year's Day! This is a 7 day party - so go visit Carolyn's blog and join the fun. Here's Carolyn's introductory video about the fabulous Gelli Plate. Happy New Year! Oh I love love love her! She has a pure fun attitude- of course that is what fairy wings and a crown does to most people! I love how you the colors to create a spotlight on her! Thanks for coming to play! Wowwwwwww! This is GORGEOUS!! I loveeeeee that heart!! Happy New Year!! How much fun is that! I not only love your punch of wonderful colors, but am intrigued by your lettering! I wish I had a tiara! 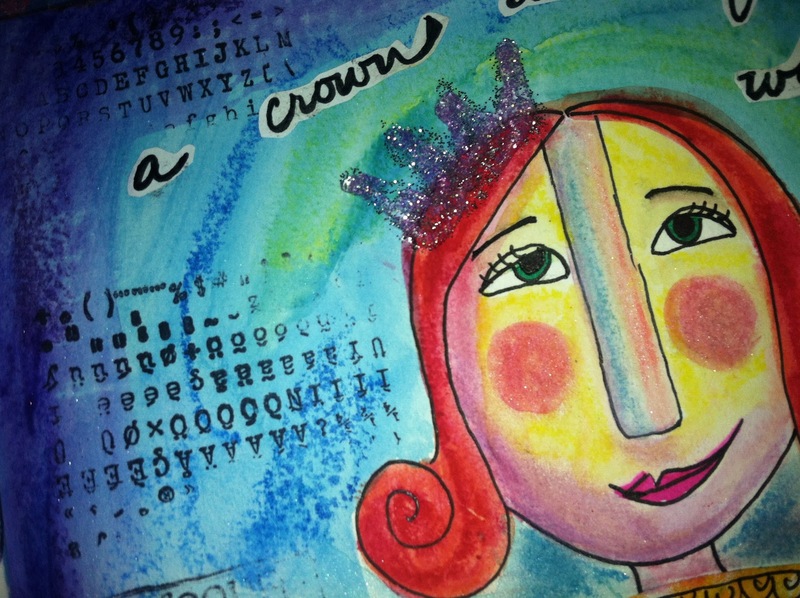 Great gelli party entry. She's too much fun! LOVE the funky dress, awesome colors, and fairy wings. See you at the partaaaay. She's adorable. Love the final page. She has something on her mind. She knows she's adorable and another creation by JSporn. WOW!. She is so beautiful, LOVE her daring hair!!. First time I heard about Gelli-plate, will check it out :). Oh, I LOVE LOVE your new whimsical banner. Happy 2013 to you too!. Hugs. Jessica, this is just too fun! Love how you used this plates, which I keep thinking about! Happy New Year! And it looks like she had a FABULOUS time!!! She is so fun! I think I'm going to have to make a party girl to go to the party too!!!! What sweetness she is! What a BIG heart,hope it doesn't get her into trouble! You may "read and treasure every comment" but I read and enjoy every piece of art you create. You talent is amazing and creativity massive. Thank You. 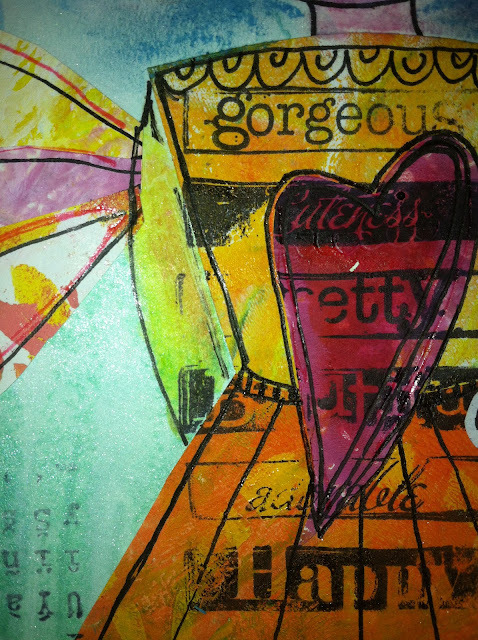 I really have to start on the Gelli Plate...love your background! She is perfectly fabulous as well...awesome! She's adorable! Can't wait to see more!